Get a Fast and Free Quote on Custom Client Gifts for your Event or Business Today! A gift of branded merchandise is an excellent way to show your customers that you value their business. At trade shows and other special events, displaying and raffling a gift of custom promotional products is a highly effective strategy for attracting new clients to your business. The key to such marketing, of course, is starting with the best quality of gift and adding custom touches to create personalized promotional items. That's why Gallant Gifts is your #1 source for gift-worthy promotional items at wholesale prices. From collectible items that are definite "keepers" to delectable treats your clients can savor right away, our wholesale promotional products cover a broad spectrum. Now you need never again waste precious work time searching store after store. Whatever the occasion, we have the perfect promotional customer gift right here! From rich chocolate assortments and distinctive desk gifts, to custom gift baskets and corporate gifts, our array of quality products will impress you. Meanwhile, the prices of these wholesale promotional products will delight you! Add your company logo and you’re good to go! 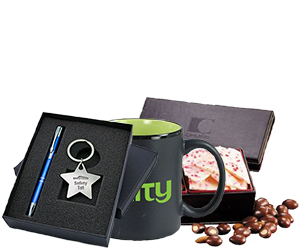 For promotional gifts that make a lasting impression and generate more sales, shop Gallant Gifts.